Don’t miss Me Got Fiyo: The Professor Longhair Centennial, celebrating both the New Orleans Tricentennial and the Centennial of the birth of the most beloved and influential pianist in New Orleans history: Henry Roeland Byrd, aka Professor Longhair. 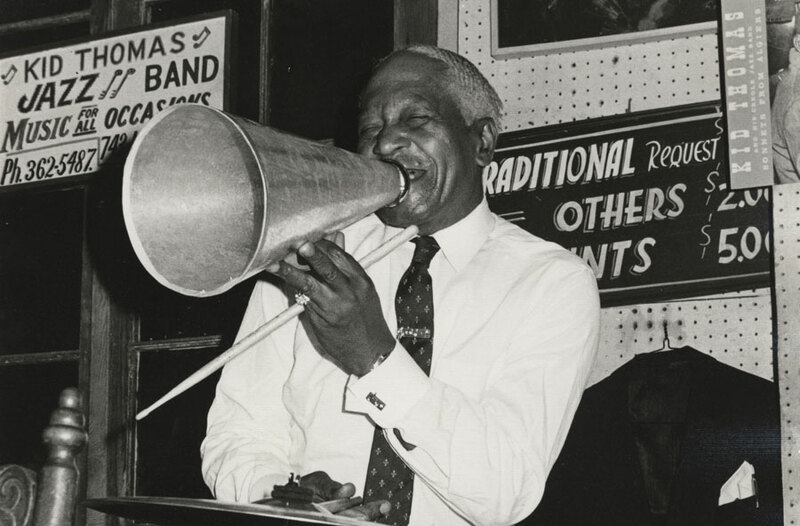 This exhibit showcases all things “Fess” from with his origins and development to his early hits such as “Tipitina,” “Mardi Gras In New Orleans,” and “Big Chief” to his 1970s comeback, his untimely death, and his continual presence in New Orleans. Saunter through Pete Fountain: A Life Half-Fast, commemorating the life of the late, great clarinetist. Women of Note highlights the role of women in the evolution of New Orleans Jazz from its beginnings in the early 20th century to today’s vibrant music scene. En Route To France examines how African-American military bands stationed in France helped popularize jazz in Paris during World War I. Do you hear that brass band with the unique syncopated drum beat? The New Orleans Jazz Museum's latest exhibit, Drumsville! : The Evolution of the New Orleans Beat, celebrates the local development of the drum kit and the ongoing evolution of the city's rich drumming traditions. Drumming reaches back to the eighteenth-century foundations of New Orleans and is still going strong. Sourced from the museum’s unique archive, the exhibit features drum kits and other equipment from the personal collections of New Orleans drum legends including Papa Jack Laine, Baby Dodds, and Paul Barbarin. Juxtaposing the traditions of improvised percussion instruments with the methods of the next generation of drummers testifies to the vibrancy of the city’s drumming tradition. Enjoy learning about our unique beat from November 8 through January 31, 2019. Museum hours are 10 am to 4:30 pm, Tuesday through Sunday. On December 5th to 7th, 5:30 to 10:30 pm nightly, the New Orleans Jazz Museum and Arts Council of New Orleans present Sound Collage at the Jazz Museum: A Luna Fête Celebration of Light and Music. New Orleans Jazz Museum's historic architecture will be transformed into a playground of light, art, and music. This celebration is free and open to the public and features illuminated installations, digital sculptures, video-mapping projections, art animated by technology and musical performances intended to engage and inspire audiences of all ages. Join us on Saturday, December 8, 2018 from 7 to 10 pm at the New Orleans Jazz Museum for our inaugural Improvisations Gala, an elegant and extemporized evening featuring live performances by Jon Batiste, Trombone Shorty Academy, Evan Christopher, and other premier musicians. Enjoy gourmet local cuisine and open bar libations from Sazerac Company, complimentary portraits by legendary photographers, a fabulous silent auction, andthe many jazz and art exhibitions within the museum, including the 2018 Luna Fête display outside on the lawn. Drink in the sights, sounds and flavors of a quintessential French Quarter evening!